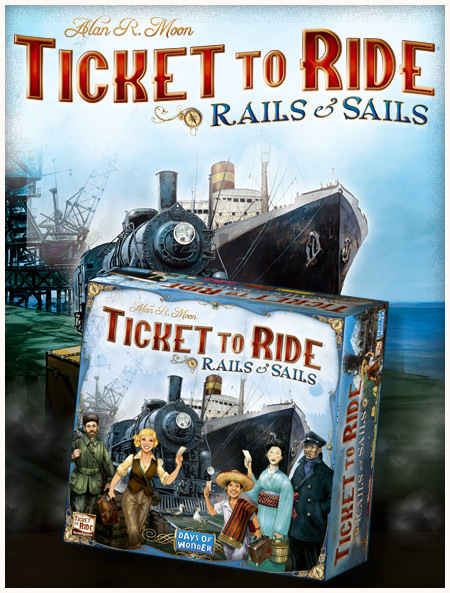 Ticket to Ride – Rails & Sails is for 2 to 5 players ages 10 and older and takes approximately 90-120 minutes to play. It is a stand-alone game in the Ticket to Ride series. It includes 1 Double-Sided Board featuring 2 Maps: the World and the Great Lakes of North America. It also includes 165 Plastic Trains, 250 Plastic Ships, 15 Harbors, 5 Scoring Markers, 140 Travel Cards (Train, Ship, Double Ship and Wild) and 120 Ticket Cards (65 for the World map and 55 for the Great Lakes map). This entry was posted on Thursday, October 20th, 2016 at 18:02 and is filed under Games, News, Ticket to Ride. You can follow any responses to this entry through the RSS 2.0 feed. Both comments and pings are currently closed. Hey guys, looks like the ‘online’ from Days of Wonder is an error. 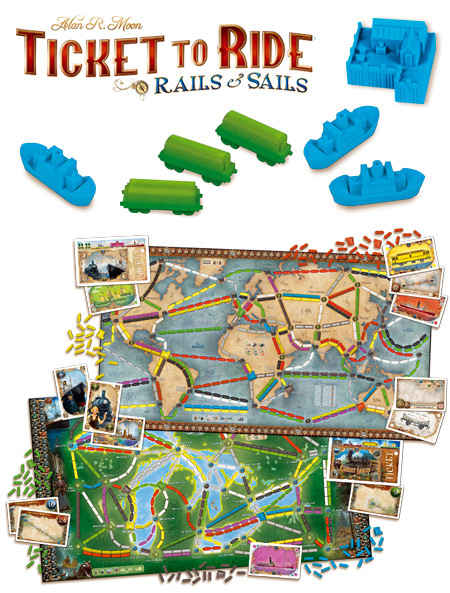 Reading further the description of what is in the box implies Rails and Sails is a board game. It is for sale on Amazon at $67.00. Thanks. Any chances this new version will become an app/app version of the game?